The last 5 were done tonight. I have my freezer back, but now we have very little counter space. All the ingredients for all 3 kinds of preserves came from the garden, except the balsamic vinegar, sugar, and cinnamon. Yay, Gardener! In my burgh, it’s fig season. I have 2 trees, and between workplace diplomacy and a neighbor with a ladder, lots of figs have been used up. I have a bunch waiting in the refrigerator, and I’m hoping they stick around long enough for a fig and almond cake. 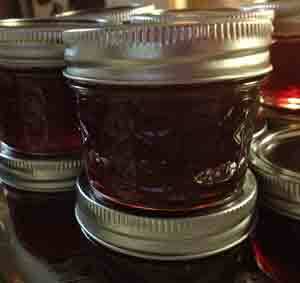 I made a good lot of fig jam (in the refrigerator). And, sadly, fig processing and knitting are not compatible (unless I want to hand-dye everything an amazing color of purple-brown). Also, some of the yard work I’ve done lately has banged up my fingers, so beyond fantasizing about getting a pair of socks done, not much knitting right now. Many books are being read in the meantime. I finished up a Laurie R King book: The Language of Bees. I’m now onto 3 others — an Edith Pageter book about Czechoslovakia, W. Somerset Maugham’s Cakes and Ale, and an Alexander McCall Smith mystery (set in Edinburgh). So far, Edith is winning. I haven’t quite figured out what the Maugham book is all about, other than making me think I’m reading unfunny Bertie Wooster (hopefully it will improve once I get used to the narrator). *3 little bags of freezer jam, carefully put in a larger freezer bag to protect them. There is a small bowl of jam waiting for cheddar sandwiches tomorrow. Last night I walked outside, at 9:40 PM, and picked a few figs in the dark. I worked by touch, selecting the ones that felt whole yet soft enough to be ripe. And yes, each time I found a soft fig, I cringed hoping I wouldn’t encounter a yellow jacket. The figs were cool in the night air, their skins slightly wrinkled and puckered. A few had split. Only a few are ripe now. There are many, many green figs showing the promise of a good crop, if the starlings get sick of them before the next crop ripens. There’s nothing like these fresh figs from an ancient tree. These aren’t like Smyrnas, or the light tan ones that one finds in the dried foods section at the market, or the ones I used to get from California. Perhaps turkey figs or some older variety from the 1920s or 30s. So now I’m looking around at different fig recipes to see if I can improve on the fig cake I made the other year. Info about fig horticulture is out there on the web. Some are hobbyists. But if you’re interested in the history of figs, and you’re trawling the web, be prepared for some fairly weird search results. I’d suggest GardenWeb for those who want to really research growing the plants. Have fun! … and the sun shines through the last few of the leaves on the trees, like stained glass. We took one more walk around the neighborhood, before the autumn chill knocks all the leaves onto streets and lawns. The streets are paved with gold and they still sleep under an overarching canopy of oranges, red, and russets. 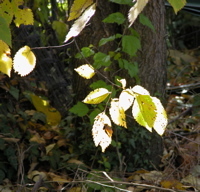 The fig leaves are turning slowly turning yellow, then dropping off the trees. And while its leaves are turning from green to red and orange, the forsythia is sporting yellow blooms. It was a beautiful day in the neighborhood, filled with beautiful gardens to gaze at and birds to watch (including yellow chickadees and black crows). May we all have such beautiful days ahead of us, filled with that bittersweet hope that changing seasons bring. And yes — there’s a lot of raking in my future too.